The rain lasted until a thunder and lightning storm at 4 AM. It blew quite hard as well for a few minutes. By 4:15 AM it was flat calm and it turned into a sunny day. But cool overcast and windy by noon and at 2 PM we had a rain shower with snow in it. Then it cleared off with more sun and the sun alone quite hot. The wind is quite cold. It was quite cool this morning. I had to wear an insulated shirt jacket when I connected up the propane tanks. Joan wore her parka and I my insulated shirt jacket to the dumpster at 1:30 PM. The weather is different than what we are used to. The puffy cumulus clouds seem so low they almost touch the tree tops. We still keep an ear out for the Trans Provincial Net on 40-meters but have come to the conclusion it is hopeless. We heard nothing after listening for 10 minutes this morning with my good Sony headset. It looks like a lost cause until we are on our way home and getting closer to La Belle Province or whatever Quebec is. The recession has hit the RV park garbage truck. It went by this morning with only one wamback and had to make two trips. The first with the wamback on the right and the second with the wamback on the left. You do not get it any more exciting than that. This note was the only thing in the mail box yesterday: “Notice During Freezing Conditions Reminder for RV owners. Leave Kitchen sink at a slow drip to reduce chances of frozen pipes. Remember to open up Gray water valve to drain.” The locals have been stating that Superstitious Mountain should have snow on the top any day. The guy behind us claims there is snow on the mountain in February. So one cannot get completely clear of snow no matter how hard they try. We are not far from California. 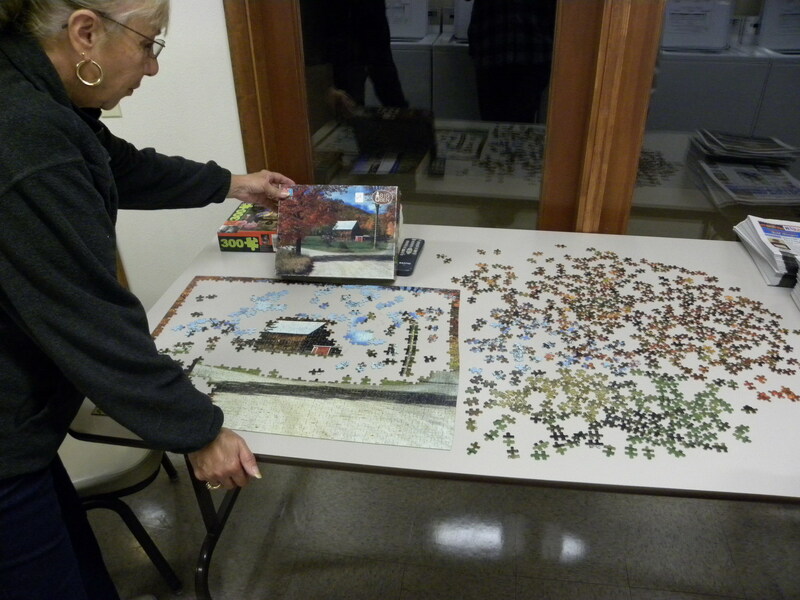 Joan claims she would sooner see Las Vegas rather than California but we just may see both. Go to California and then up to Alberta via the I-15 through Las Vegas. Time will tell. We are not far from the Williams Gateway Airport for the city of Phoenix and area. We were given to understand it was the airport for both Phoenix and Tucson until we bought a map. Tucson has their own international airport. Someone here has what I am convinced is an old Harvard that they call a Texan in the U.S. It certainly looks and sounds like a Harvard. Phoenix also has Luke Air Force Base on the west side of the city. We are on the east side. There are at least six airports here. No wonder we see and hear so many aircraft. The Glendale Municipal Airport is just east of Luke Air Force Base. The Phoenix Goodyear Airport is just south of those two. The Harbor International Airport is nearly downtown Phoenix and the Phoenix Deer Valley Municipal Airport is just north of Phoenix. It must keep someone busy just making certain any strange aircraft lands at the proper airport. Well, we had a perfect day doing nothing and we did it very well. We ended the day at the laundry working on the jig saw puzzle. 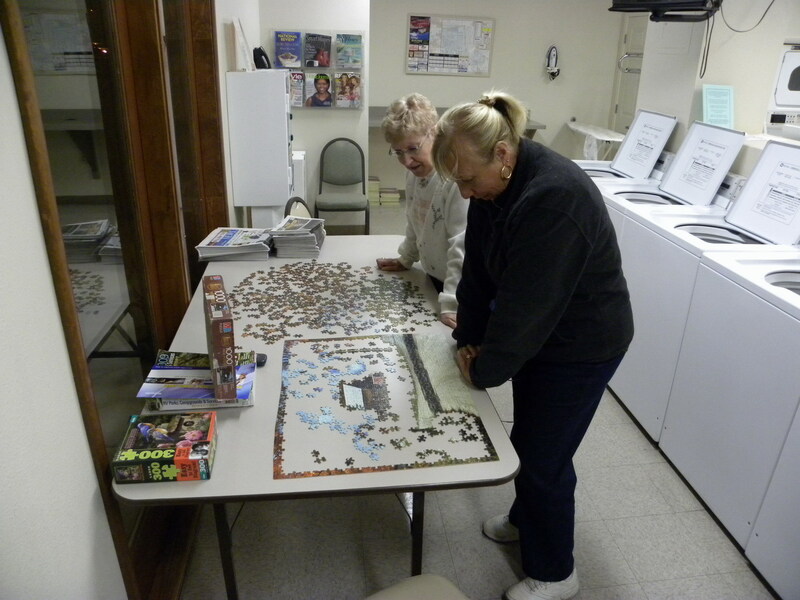 This is Karen and Joan working on the current jig saw puzzle in progress at the laundry. 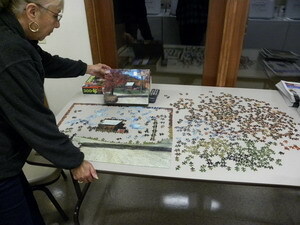 This is Karen showing the current jig saw puzzle in progress at the laundry. 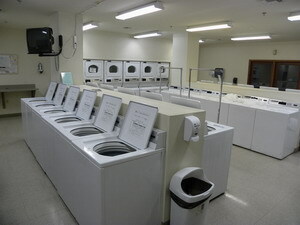 This is the laundry and it is very nice. No wonder so many in this park keep returning every winter. One is used very well indeed and the cost of parking here is the same as it is back in Nova Scotia at the Land of Evangeline. Some of the units still have their Christmas lighting up and lit. 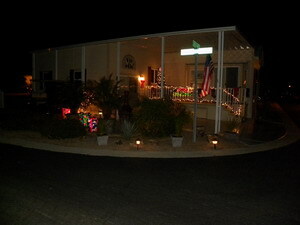 This is the park model that is for sale with the golf cart that I included in Part 27 as photo nine.